There are about a million and one ways to design a wine cellar. With wine cellars being a design industry that is constantly evolving, the options to customize are unlimited. From the lighting, all the way down to the floors, there is wine cellar décor out there for every style. Custom artwork can be used to show off your personal style when designing a wine cellar. Have a piece of art added to your cellar to give a little something extra to the design. Paintings, maps, and murals are all a great way to show your personal taste in your residential wine cellar. Check out one of our recent wine cellar design project in Williamsburg, VA. The homeowner elected to have a map of the vineyards of Australia incorporated into his design because of his affinity for wine from the country. Add a custom counter or tabletop to your wine cellar to enjoy your collection with family and friends. Wine barrel tables also make a great accessory for displaying wine bottles or a small tasting area. If you are looking for something larger you can always add an area specific to wine tasting outside of your cellar. Utilize unique lighting options to really show off your collection to family and friends. A chandelier or other custom lighting is always a great way to add something extra to your wine cellar design. What kinds of lighting can be installed in a wine cellar? 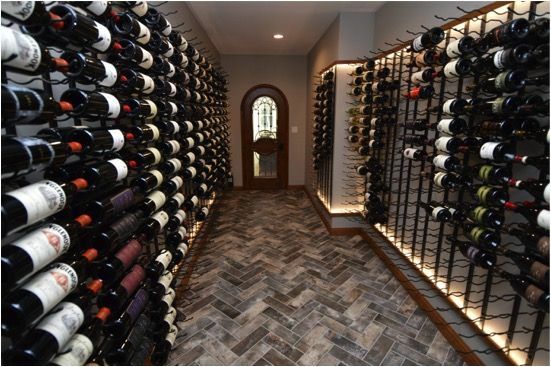 There are so many different types of flooring out there for wine cellars it can be hard to pick just one. A good thing to keep in mind is the design aesthetic that you are going for. For a traditional and modern design, hardwood flooring is a great option. With the many stains and colors, it can flow into any design in a flawless fashion. If you are looking for something even more unique reclaimed wine barrel flooring is a stunning idea for any cellar. Ceilings: Custom ceilings are one of the many options out there for wine cellar décor. Add texture to your ceiling or wood for an overall warm feel. Hardware: Make wine cabinets and cellar drawers stand out by adding hardware specific to your personal style. Ladders: Add a rolling ladder to your wine cellar to achieve that wow effect when guests enter the cellar. A ladder also provides easy access to your entire collection if you have floor to ceiling racking. One of the many ways you can incorporate contemporary elements into your wine cellar is with racking. With the rise of modern design, there are tons of fun designs out there fit for any cellar. Float wine racking is a great way to add a modern take to your wine cellar. Metal wine racks also are a great option for contemporary wine displays in modern cellars. Custom wood racking can add an elegant and traditional flare to your wine cellar. 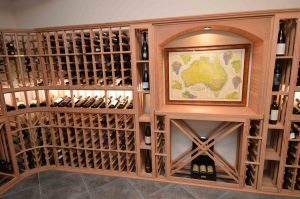 If you are more interested in staying with traditional design, there are plenty of stain and lacquer finish options to customize your cellar. Contact Harvest Custom Wine Cellars and Saunas with all your wine cellar design and decor questions. We offer free CAD drawings so you can visualize what your residential wine cellar will look like after it’s built. 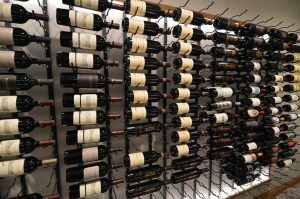 From racking options to the best refrigeration systems, we can help you through each phase of the wine cellar design process.